Do you have an awe-inspiring piece of art or a beloved memento you want to showcase on a wall? Put down that hammer! This time, rely on High & Mighty™ hangers to mount your decorative objects on drywall in seconds. However elegant the outcome, hanging art, photos, or mementos on drywall can be a painstaking process. During the balancing act required to precisely position nails, screws, or other picture-hanging hardware while swinging an unwieldy hammer, you can drop the fastener, stub your finger, and still end up with your artwork woefully askew. But here’s some good news for all those who have ever hesitated to switch up their decor merely to avoid these mishaps: In the time it takes to hang one framed picture using that old-fashioned, awkward approach, you can create an entire gallery wall with a helping hand from the new High & Mighty™ line of hangers. This collection from the Hillman Group includes wall hangers, decorative hooks, and key rails (as well as hook rails and floating shelves coming soon!) that require only your own two thumbs to install. These sleek yet strong hangers are decorating essentials for both first-time and experienced homeowners who need to dress up drab walls in a hurry. Because the unique hanging technology can support items from 10 to 125 pounds, these little wonders can mount everything from small mirrors and picture frames to heavy mirrors. Keep reading to learn the secret behind these smart must-haves and find the solution to every hanging quandary you’ve ever encountered. Designed with homeowners of all DIY skill levels in mind, High & Mighty™ hangers can be installed in drywall without using bulky hammers or heavy drills or pesky anchors, nails, or screws. Instead, through a simple place-push-hang installation process, your own two thumbs do the work of an entire toolbox. Hanging anything with a High & Mighty™ wall hanger is just that simple: Position the solid steel fastener in the desired location on the wall, push the sides of the hanger into the drywall using both thumbs, then hang the decorative object. For hooks and key rails—and, soon, hook rails and floating shelves—installation is just as hassle-free. Place the hanging mount on the wall, press it into the wall according to the illustrated directions, and fit the product cover (be it a hook, rail, or shelf) snugly over the top. Plus, each hook rail and floating shelf package will include a template and miniature level to help you avoid lopsided hangings and achieve picture-perfect results every time. No matter what home accent you’re trying to hang—a framed family photo, a collection of keys, a child’s backpack…you name it—High & Mighty™ offers a super-strength hanger tailored to the task. To help you identify exactly which option best fits your needs, High & Mighty™ has an easy-to-use web tool that asks two questions: what type of object would you like to hang and how much does it weigh? You’ll then be given a set of personalized recommendations that may include any of the following wall-hanging heroes (as well as their weight capacity). Wall Hangers: Designed for use with picture wire, saw-tooth mounts, and ring-style mounts, High & Mighty™ Wall Hangers offer the perfect resting spots for picture frames, art canvases, mirrors, and clocks. Despite the slim silhouette of these coin-size hangers, their solid steel construction allows them to safely and securely support heavier decor. Just select a hanger suited to the size of your decorative accent (whether 20, 40, 60, or even 125 pounds), and follow the easy place-and-push installation steps to secure it to your wall in seconds. Available at Lowe’s. 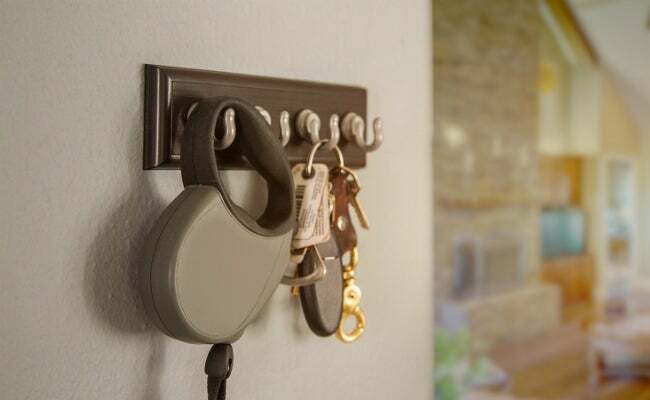 Decorative Hooks: Have you run out of closet space to hang your hat, coat, bag, or backpack? Relocate everyday garments and accessories to High & Mighty™’s metal or plastic Decorative Hooks to keep clutter at bay. Squeeze a hook or two into almost any open wall space—like a tiny entryway or a closet sidewall—and enjoy seriously strong storage in an instant. Available in 10-, 15-, 20-, and 25-pound capacity versions, these trusty hooks with sturdy steel wall mounts stay put where traditional hooks falter. (In fact, they offer up to five times the strength of other tool-free hooks.) And the variety of shapes, styles, and colors—from oval to rectangular, and solid white to oil-rubbed bronze—boost a wall’s form as well as function. Available at Home Depot. Key Rails and (coming in Fall 2017) Hook Rails: Who said key rails are only for keys? High & Mighty™ Key Rails and Hook Rails make it possible to hang up and organize many small collections found throughout the home. Both boast steel mounts sturdy enough to hold jewelry, coffee mugs, and leashes on the 5- to 10-pound key rails and even coats, bags, and umbrellas on the generous 30- and 50-pound weight limits of hook rails. Choose your favorite hook and plaque styles—like key rails with elegant oval rings or hook rails with a storage-friendly double-hook design—and the four to six strong hooks built into each rail make it easy to corral essentials in a convenient location like the mudroom, kitchen command center, or master closet. With your possessions so neatly displayed in a row, it’s never been so easy to find what you need! (Coming in Fall 2017) Floating Shelves: With High & Mighty™ Floating Shelves at the ready, you can install stylish vertical storage at a moment’s notice—no need to even stop to find a stud! The 18-, 24-, and 36-inch shelves offer just enough space for displaying indoor plants, photos, lightweight decor, and mementos. They’ll even help to clear clutter from work surfaces: Mount one in just minutes in a storage-starved bathroom to relieve your crowded vanity of some bottles or above the desk so you can move your mini library to the wall. Whether you opt for a white ledge with beveled corners or a more modern style with straight edges and an espresso finish, the 17 shelf variations allow you to match the color and design scheme of the room. High & Mighty™ hangers are built to last, but they’re also easy to remove when your wall is ready for a fresh face. Simply lift the artwork or other decorative object from the hanger (and, if needed, slide the hook rail, key rail, or floating shelf off the hanging mount), then wedge a flathead screwdriver beneath the hanger and gently pry it from the wall. The reusable fastener is ready for its next placement, and the wall itself will show almost no evidence that anything had been there. Unlike conspicuous nail and screw holes that can turn a wall into an eyesore, the minor holes left behind by the claws of High & Mighty™ hangers mean that your drywall needs barely any preparation before your next round of decorating. Just repeat that same speedy place-push-hang installation process to reinvigorate your walls with a new look. Eager to get started on a super-simple wall refresh? Find out where you can get your hands on a new High & Mighty™ wall hanger. This content has been brought to you by The Hillman Group. Its facts and opinions are those of BobVila.com.